A good preface must be at once the square root and the square of its book. Critical Fragment 8 in Freidrich Schlegel and Peter Firchow (trans. ), Friedrich Schlegel's Lucinde and the Fragments (1971), 144. Imagine a person with a gift of ridicule [He might say] First that a negative quantity has no logarithm; secondly that a negative quantity has no square root; thirdly that the first non-existent is to the second as the circumference of a circle is to the diameter. That this subject [of imaginary magnitudes] has hitherto been considered from the wrong point of view and surrounded by a mysterious obscurity, is to be attributed largely to an ill-adapted notation. If, for example, +1, -1, and the square root of -1 had been called direct, inverse and lateral units, instead of positive, negative and imaginary (or even impossible), such an obscurity would have been out of the question. Theoria Residiorum Biquadraticorum, Commentario secunda', Werke (1863), Vol. 2. Quoted in Robert Edouard Moritz, Memorabilia Mathematica (1914), 282. The sum of the square roots of any two sides of an isosceles triangle is equal to the square root of the remaining side. The original script by Noel Langley was revised by Florence Ryerson and Edgar Allan Woolf to produce the final screenplay of movie The Wizard of Oz. Whoever originated this particular line, it was said by the Scarecrow character on receiving his Doctor of Thinkology Degree from the Wizard. Screenplay as in The Wizard of Oz: The Screenplay (1989), 123. He dropped Math and took up Divinity. 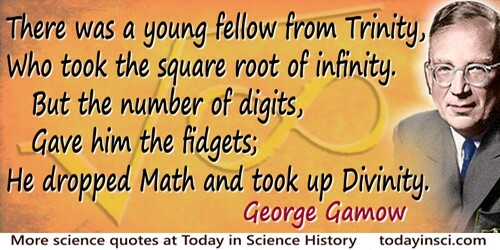 Think of Adam and Eve like an imaginary number, like the square root of minus one: you can never see any concrete proof that it exists, but if you include it in your equations, you can calculate all manner of things that couldn't be imagined without it. In The Golden Compass (1995, 2001), 372-373.